Does this enhancement impact TTM Daemons, TTM Router Daemons (WAN Routers) and Remote Hosts? TTM Daemons, TTM Router Daemons (WAN Routers) and Remote Hosts receive all order and fill data from the TT Gateway and filter that data to the specific client applications based on the automatically configured TTM subjects. When sharing order books, the enhancement results in fewer messages being forwarded. Therefore, in upgraded trading environments TT Daemons, TTM Router Daemons and Remote Hosts experience less traffic than environments with older TT Gateways and client applications. Does a workstation that enters recovery affect other traders? Recovery occurs in the same way as older versions. Also, in networks with multiple LANs, each TTM Router Daemon (WAN Router) uses the automatically configured TTM subjects to determine whether to filter or forward data. This allows network segments that do not require the data to drop the additional traffic at the WAN Router without impacting their connected clients. How does TT secure trading data in a upgraded environment? TT Gateways mask order and fill data, including the TTM subjects, using obfuscation when forwarding data to the TTM for delivery to the client applications. This method allows data to be encoded before being placed on the wire while not affecting overall gateway performance. 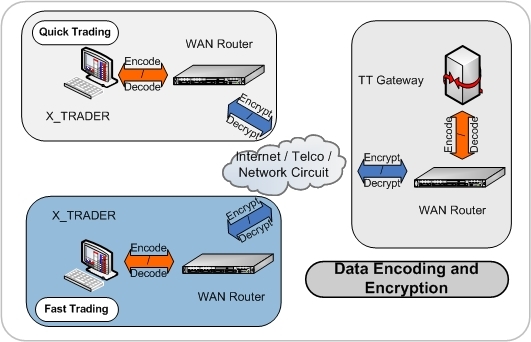 Encoding: TT Gateways mask order and fill data, including the TTM subjects, using obfuscation when forwarding data to the TTM for delivery to the client applications. This method allows data to be encoded before being placed on the wire while not affecting overall gateway performance. Encryption: TTM provides authentication and encryption between WAN Routers and between a Remote Client and Remote Host Daemon.